THE ODIOUS CONSTRUCT have been gathering attention since at least their 2016 demo in various Facebook groups I've been in, and for good reason! The band falls into a newer niche I have been seeing around: mixing tech death with symphonic and orchestral elements. The idea to do this isn’t that new and traces back to its roots in bands like FLESHGOD APOCALYPSE and MIRRORTHRONE. This newer incarnation however has an ever so slight difference with its tech death influence. I like that I’m seeing he Artisan Era trying to diversify its portfolio in this manner. This year they signed another similar band, MORDANT RAPTURE. Right off the bat “Vortex of Self” hits the listener with an opening riff that reminds me of something off the debut VIRVUM album. The song is peppered with orchestral flourishes but they don’t define the song, rather they accent the riffs. The solos are downright fantastic. There is already a nice variety in rhythms to switch things up. Into the second song “Descension” is a no holds barred affair with dueling vocals. I’m not sure if someone is handling backup vocals, but it sounds like they do and I really enjoy the 2 styles of mid and low growls. Even in this faster song there is a switching up of rhythms and tempo that keep it fresh. The creepy keys on “They Came Through the Mirrors” accent a song reminiscent of THE BLACK DAHLIA MURDER . Every song on this album has a great solo that accents the song and doesn't feel forced. “Cyanide Eyes” has some great audible bass lines with a ton of atmospherics and lumbering rhythms. 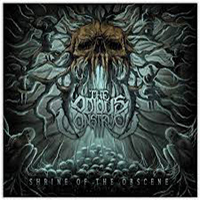 The closer “Shrine of the Obscene” and title track caps off the EP with some cool orchestral vocals in the intro. The lyrics seem to speak of embracing the darkness within us and how we choose our vices and worship them, which perfectly match the tone of the music. In closing this band is the equivalent of sonic cheesecake. Everything is super dense and there is a lot going on. However, the dynamics and songwriting don’t suggest filler or anything misplaced. Like anything else on this label it really begs you to be an active listener, as passively listening will make you miss out on all the details locked within. You can rest assured if The Artisan Era signs a band, the passion for technical and thought out songwriting will be there. I hope they continue to expand their signings to more variety as they have with this band and others to come. Overall: One of my favorite EP’s of 2018. I look forward to what this band writes going forward. Fantastic, Furious, Brutal, Beautiful.